Looking to stock up on all kinds of goodies this weekend? Look no further - starting today we have a variety of sales and discounts that will be available this Black Friday! Enjoy a scaling charge bonus of Zen up to 25% and a wide array of game-specific bonuses. Check each games' individual news page and each game below for more information. Arc Players: Save 50% on select item packs from Nov 23-28, plus adventurers who purchase Zen through Arc will unlock free items, including mounts like the Gilded White Steed, Ice Panther, Owlbear and more! For additional details, please visit us here. Arc Players: Save 50% on select item packs from Nov 23-28, plus captains who purchase Zen through Arc will unlock free items, including R&D Packs, a T5 Sovereign, a T6 Prometheus and more! Xbox Live Silver Members: Save 20% off from Nov 22 – Nov 28. Xbox Live Gold Members: Save 30% off now through Nov 28. PlayStation® Plus Members: Save 30% off from Nov 28. PlayStation® Players: Save 20% off from Nov 22 – Nov 28. 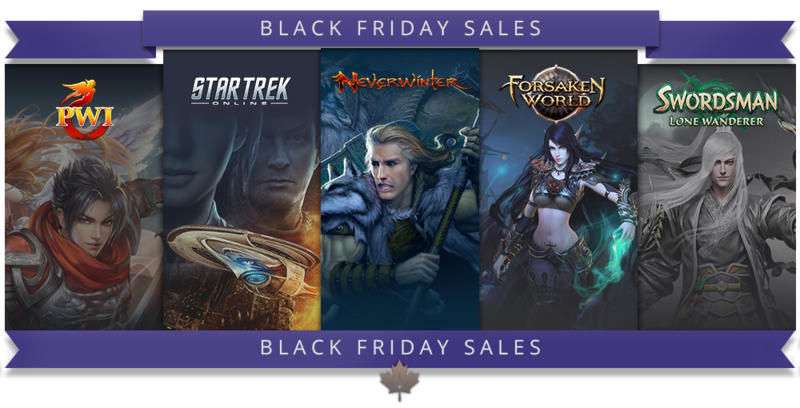 Arc and Steam Players: Save 30% off from Nov 23 – Nov 29. Save 20% off Special All Class Pets. Save 45% off the War Front Supply Crate. Save 52% off Medals of Glory (5). Save 25-75% off select Mounts, Utilities, Shop and Fashion Items. Save 34-53% off select Orbs. Save 20-25% off select Upgrade, Utility and Refining Items. Save 25% off a huge selection of Handhelds and Fashion Items. Join a special event from Nov 25-30 to win a Kluer statue. Save 20% of all Lv. 3 Gems and 30% off all Boost items from Nov 25 -30.